Personalized leather money clip is designed in genuine leather and uses powerful magnets to hold it securely closed. Specify initials in order; first, middle, last. Specify color: black or brown. Custom leather money clip is 1 1/2"L x 2 1/2"W.
It looks nice. I only hope my husband will like it when I give it to him for his birthday. My husband has always liked having his paper money neatly arranged in a small and concise manner. 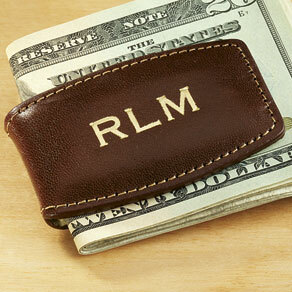 With his personal initials included, the money clip was a perfect Christmas gift! Thank you, for a wonderful holiday gift for my son. Very good quality and very nice. Was purchased as a gift, however my husband also has one. He uses it everyday! It works great and fits in your pocket nicely. Easy to use and light weight. Hopefully a great Christmas gift. Got this for my husband. Very nice,works well. Gave this to a young man on his 16th birthday. He loved it. Makes a great money holder as a gift when personalized. This should have read JIM and not JEW. Why so many sent to me? I ordered two money clips. One with AMY and one with JIM. The first one I received said JEW. I wrote to them and they said to throw it away. Then the second order sent two. AMY and JIM so it was correct. Today I received another one and it said JIM. This means 4 in total were sent. I hope I'm not being charged for all these. What's the story? Poor quality material. Has look and feel of vinyl instead of leather. Magnet very weak. If you try to carry more than a few bills, the clip opens up, which defeats the purpose of having a magnetized money clip. Imprint looked like it was years old. I have bought this money clip in the past for my husband. The old ones had rectangular magnets the length and width of the clip itself which have always worked well. This new one has tiny, very weak disc magnets at the tip of the money clip...they barely hold a couple of bills. Very disappointed. I wasn't able to return it due to the personalization (there's a lesson there, too). Wasn't exactly what I expected. Was expecting a money clip that was actually a clip. Tested it with several dollar bills and it really doesn't hold much without slipping. Otherwise it is nice, monogrammed[...]. Nice color, nice lettering . . . BUT; I bought two for two grown sons for Christmas presents, and I choose not to give it to them, as they appear like something an adolescent might use. No substance to them; lightweight, cheap looking. No refund because they were personalized. I called, complained, and am still very disappointed in them and Miles Kimball for not refunding my money!